Riona Cotter, HSE Programme Manager, Implementation Group for the National Standards for Bereavement Care Following Pregnancy Loss and Perinatal Death; Dr Keelin O’Donoghue, Consultant Obstetrician at Cork University Maternity Hospital and Principal Investigator at INFANT. A new website has been set up to support families grieving the loss of a baby. 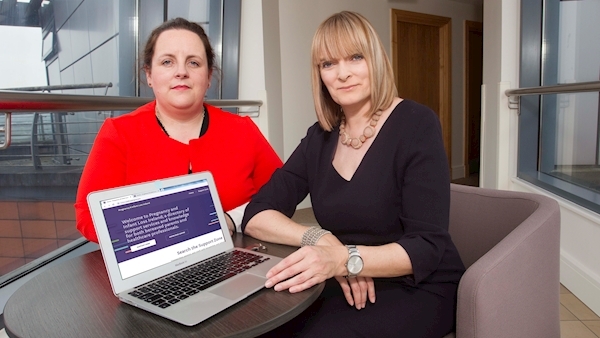 The first-of-its-kind website in Ireland was launched by the INFANT Centre at University College Cork in partnership with the Irish Hospice Foundation. Pregnancyandinfantloss.ie will offer the latest research into the cause of baby loss while promoting emotional well-being and offer details on how to access the appropriate support services. Pregnancy loss is the most common complication of pregnancy. Dr Keelin O’Donoghue, Consultant Obstetrician at Cork University Maternity Hospital and Principal Investigator at INFANT – which Ireland’s only dedicated perinatal research centre – said the website will help raise awareness. “The website is a step forward in our commitment to consistent quality care for parents, as well as education and support for maternity staff while raising awareness of pregnancy loss and recognising its wide impact,” said Dr O’Donoghue. The website is an initiative of the Implementation Group for the National Standards for Bereavement Care Following Pregnancy Loss and Perinatal Death. The programme of implementation of the Standards was led by Dr O’Donoghue and HSE Programme Manager Riona Cotter. The Standards, launched in August 2016, defined the care parents and families should receive following a pregnancy loss or perinatal death in all Irish maternity hospitals. Irish Hospice Foundation CEO Sharon Foley added that they were very proud to support the website. “The loss of a child is devastating to any parent,” said Ms Foley. “Grieving parents should be able to access sensitive and consistent bereavement care at every stage of their journey and in every location throughout Ireland. “Maternity hospitals play a vital role in supporting parents whose child dies following pregnancy and post birth. “It is vital we support staff with tools and information which will equip them to give this bereavement care to parents.